I love this time of each month when the new block of the BOM Midnight Posies is posted. It is so fun to see all the bright colors and this simple Rose block is one of the brightest and most cheerful. And never was there an easier rose block than this one. This quilt has 12 blocks plus a machine appliqued floral border. Block #4 stars row 2 of the quilt. No new techniques are added to this block but the color placement becomes increasingly important as we explore all the possibilities of the versatile nine-patch block to create lots of different flowers. Next month we will introduce quarter square triangles to add to your repetoire of skills in this simple quilt. If you are a beginner you will be amazed at how this simple addition multiplies the possibilities in your quilts. 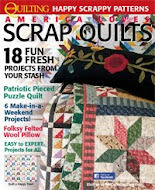 Experienced quilters will enjoy how fun and easy it is to create such varied blocks with minimal changes in piecing technique. No matter what your level of experience, I hope you will love this month's Rosey Posey Block. 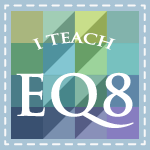 If you are joining us late and still want to get the first three blocks and the supply list, click on the image of the quilt in the side bar at right and you will get access to all the blocks todate. I will only leave the earlier links open for a few more weeks, so if you haven't saved the pdf files for those blocks, please do so right away. After June 1, only the current month's block will be available! Thanks to all of you for your wonderful support of this project. Enjoy! This Saturday and Sunday, April 25 and 26 is the Kaw Valley Quilt Guilds's annual Quilt Show at the Douglas County Fair Grounds in Lawrence, KS. If you are in the area I encourage you to attend. 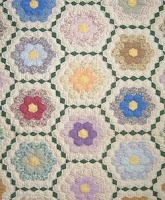 The theme of the show is "A Quilted Garden", and there will be lots of fabulous quilts to see, vendors to shop with, and free lectures, workshops and demonstrations. There is also a silent auction for miniature quilts made by guild members, with proceeds going to local charitable causes. Hope you can make it. This was the first public exhibition of my new Color Wheel Quilt! 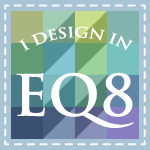 I made its first informal showing at a color class I taught in late March and again April 21 and 22, when I spoke on Color Confidence for Quilters at the Kaw Valley Quilt Guild monthly meetings. I am debating wether I should bring this out as a pattern or as a kit. I thought some might find it fun to find all these fabrics, but others might prefer to have all the colors supplied. Which would you prefer? Thanks for the suggestions. I thought I would share a few pictures of my quilt studio. When my son went to college his large basement bedroom was immediately appropriated as my new quilt studio. The dark long and narrow room got new wallboard, insulation, and a coat of paint. The old carpet was pulled up and fresh wood-grain vinyl flooring was rolled out. The best part, for me anyway, was my new "view". The veranda in the picture is a wallpaper mural that covers all of one end of the room and wraps around one corner about 2 feet. I arranged my machines to face the veranda so that I can "look out" at the sea while I sew. It really gives the space a sense of spaciousness and warmth. I used parts of an old computer desk unit for my machine tables and have my Bernina, serger, and Jukie at hand, with my ironing big board right behind me. It is a great space to work in. The 2 table mounted Ott Lites and the new overhead track lights really give me great light for sewing. My storage area for stash is one of the 2 closet in the room. I installed wire shelves and organized my stash by color in clear bins. I really need a second closet, but so far I am managing to contain my stash -- well most of it -- in this closet. The drawer units hold large cuts, quilt backs, and UFO's. The small stool allows me to reach boxes on the top shelf without breaking my neck! The "Book Nook" is my favorite corner of the room. My quilt books and magazines are stored here and I often sit in my rocker and look through books for inspiration or research. The kitties often curl up on this rug -- a bargain at an outlet store (the rug not the kitties) -- and keep me company while I read or do hand work. The last picrure is the view of my studio from the far end. My cutting table stands in the middle and has 2 leaves that come up when I need more cutting room. The drawers and cupboards are perfect for rulers and rotary cutters and all my tools store nicely in stacked bins inside the cupboards. Since taking the picture, I have added an antique pie safe on the wall where the ironing board is and it is filled with quilts, extra batting, and works in progress. As for my son, not to worry. Not only has he graduated from college and officially moved out to start his career in Texas, but I have a guest room upstairs for him when he comes home! But I sure love my new studio and find it a wonderful workable space. Now, if it was only this clean all the time! My Easter wish for each of you is a spacious studio of your own to work and create in. Thanks for taking a look at mine. What fun it is to go to a 5 day retreat! A group of friends from my online quilting group, SewManySwaps, attend a retreat twice a year in Winslow, Arkansas. We have been going since 2002 and it feels more like family than friends each fall and spring when we make the short trek from Kansas to the beautiful Boston Mountains in the Arkansas Ozarks. The scenery is spectacular, our hosts at Sky View Lodge are welcoming and wonderful, and the time with friends oh so precious. I was able to finish this Merry Go Round Quilt in sweet baby fabrics. Shhhh, don't tell, but this will be a baby gift for my Nephew Corey and his wife Jeniffer who are expecting any day now! Wow, I better get it quilted this weekend! I was so pleased to get my color wheel quilt finished while at retreat. It came out just as I hoped it would. What a challenge it was to find just the right fabrics for each hue, tint, shade, and tone. I ripped out the whole center wheel and replaced it with darker tints, as the first set I had were too pale. I used those 12 tints to make piping around each of the dark shades in the outer ring, making the grayed tones between them really show up. The outer border has the 3-D effect I was hoping for, altho the dark green is a bit darker than I had hoped. But now it is ready for quilting and I am looking forward to having it completed in time for a quild presentation I am giving this month at the Kaw Valley Quilt Guild in Lawrence, KS on "Color for Quilters." I am going to bind it with a fabulous multi-color stripe cut on the bias. I finished this set of indigo and white blocks for a block swap I am participating in. They really came out nice and were a lot of fun to make. I still have another set to make and then off they go. I do so love going to retreat! It charges my creative batteries and refuels my soul. I hope each of you have the opportunity to attend a sewing or quilting retreat as often as you are able to go. It will do you so much good. Oh, and get a massage while you are at it. Our wonderful masseuse gave me a "hot rock" massage while I was at retreat. AHHHhhhhh, I thought I had died and gone to heaven. I am working on my next 2 patterns that will be published this summer. I will provide a sneak peak soon, when I get the tops done. Hope you are having a wonderful spring. My daffodils are blooming!! How about yours? Would love to hear what you are up to. Please post a comment and share your spring projects!